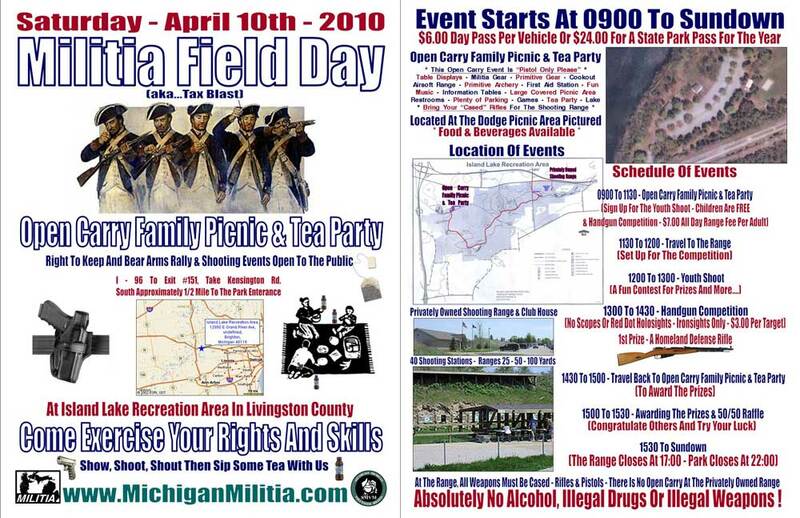 Since the FBI raid on the Michigan based Hutaree Christian militia, other Michigan militias are trying make it perfectly clear they do not have the same philosophy. “Show, Shoot, Shout, Then Sip Some Tea With Us” is the slogan of the get together, and the primary objective is to take the stigma out of the word ‘militia’. I think this is a really good idea. Although I believe they are going to have trouble distancing themselves from Hutaree, because it seems like the only major difference is lack of religious extremism. Guns, realistic training, disaster preparedness, and differing views on government are all still very prevalent; those types of things are what will continue to frighten people. I wish them the best of luck with their efforts. It definitely looks like they have a fun day planned. I love first prize…a $100, 90 year old Russian Rifle…. You’d think the Liberal community would be encouraging this, what with their rampant open mindedness and fantastically tolerant attitude towards all.